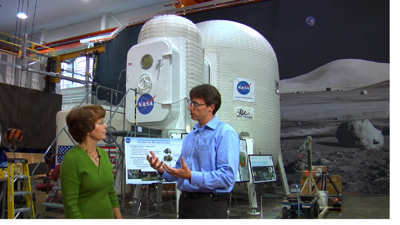 Kim Land, Public Affairs, Outreach and Education Manager for the Exploration Technology Development Program (ETDP), provided us the opportunity to shoot NE@ segments on the lunar manipulator arm and the inflatable lunar habitat. Both are just concepts and in not in anyway the final product. I really love this perspective of the lab. 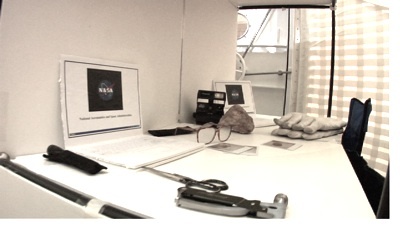 Above us is the lunar manipulator arm and to the far right is the inflatable lunar habitat concept. The arm actually lifted the airlock structure (the one with the American flag) for the first time right after our shoot. The structure is designed to lift 1 metric ton on the lunar surface at the tip of the arm or approximately 150 kilograms on Earth. Because the airlock mockup weighs about 220 kilograms the manipulator arm lifted the airlock from the elbow. The arm can lift about twice as much at the elbow compared to the tip. John Dorsey will provide more info on the arm in the NE@ segment. Also, check out the cool backdrop. 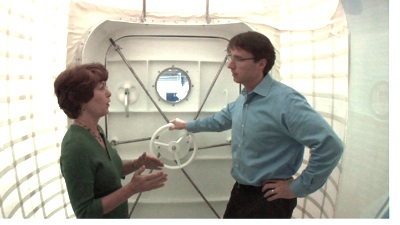 Next, Karen Whitley gave us the scoop on the inflatable lunar habitat concept. I am sure most of you have seen this concept on the NASA Portal but it was pretty awesome to take a tour inside. NASA and ILC Dover are studying cool ways of developing inflatables that will endure harsh environments i.e. the lunar surface. This particular concept which is about 50 m3 is designed for two astronauts. The actual habitat will need to be much bigger, say around 150 m3. In fact, I’ve tasked Blair to live inside the hab for a week as part of his medianaut training. I don’t think he’s seen the official email yet so let’s see how long it takes for him to respond to this post. Special thanks to Kim Land, John Dorsey, and Karen Whitley for allowing us to shoot in the structures lab. You guys rock! That is awesome! Those rooms look very spacious, for life on the moon anyway! I just cannot even wait until they get back to the moon, it’s sooo exciting! That looks awesome and the picture are just as cool. I am looking forward to NE@. I actually read something about that in the newspaper. Sounds pretty cool, and looks that way too! This is beautiful, an excellent way to spend tax dollars! I bet once on the moon, you could rent out the habitat to anybody that happens by and is a wee bit tired, just need a sign out front: Motel Moon! Rent a Unit today and leave all those weighty problems at home..
Yeah you guys look like you have great jobs. Must be a great feeling to be on the cutting edge of discovery. I can’t find an article on it so I’ll just post here. The regular news agencies posted an article on some problems encountered with the new moon vehicle under development. I read there were not only financial issues, but also some tech issues like heat shielding. I have one question. Why do you have to build a moon vehicle that needs to enter the atmosphere? If you have a vehicle that travels through space, why not leave it in space? Build it in components, assemble in space, and dock it at the International space station. You could have smaller vehicles that could be launched via rockets to transport people on and off. You would only have to worry about heat shielding on smaller transport vehicles and not the entire moon vehicle. And as a suppliment for transportation on the moon itself, why not use a ruggedized version of the segway? I thought it would be an effective method to increase an astronaut’s range while on the surface. They’re compact and in reduced gravity would be easy to handle. Those are just my 2 cents. Take em for what they’re worth.. Thanks again and we do appreciate everything NASA does, even though our government doesn’t. Hi. Can someone give an update on the status of this project? I don’t have a lot of details about what is currently happening, but I do know that work is still being done on both. Remember, these technologies were not tied to an specific mission, so work on these technologies continues to be developed. 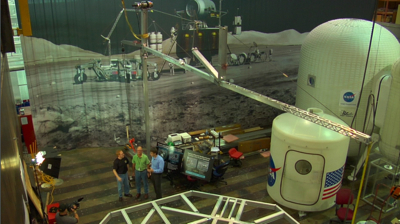 In fact, we were considering doing a future vodcast on the Lunar Manipulator. Until we do, I’ll try and track down some more details.